Hickory | aka: pecan nut, pecan hickory, sweet pecan, nogal morado, and pecanier. Growth: United States and Mexico. The hickories are an important group within the eastern hardwood forests. Botanically they are split into two groups: the true hickories and the pecan hickories (fruit-bearing). The wood is virtually the same for both and is usually sold together. 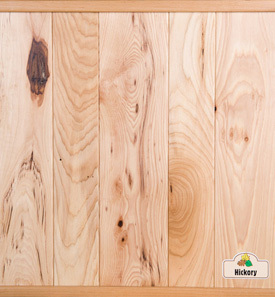 The sapwood of hickory is white, tinged with brown, while the heartwood is pale to reddish brown. The heaviest of American hardwoods, the hickories can be difficult to machine and glue, and are very hard to work with hand tools; therefore, care is needed. They hold nails and screws well, but there is a tendency to split, so pre-boring is advised. The wood can be sanded to a good finish, can be difficult to dry, and has high shrinkage. Hickories are well-known for their very good strength and shock resistance, as well as excellent steam-bending properties.